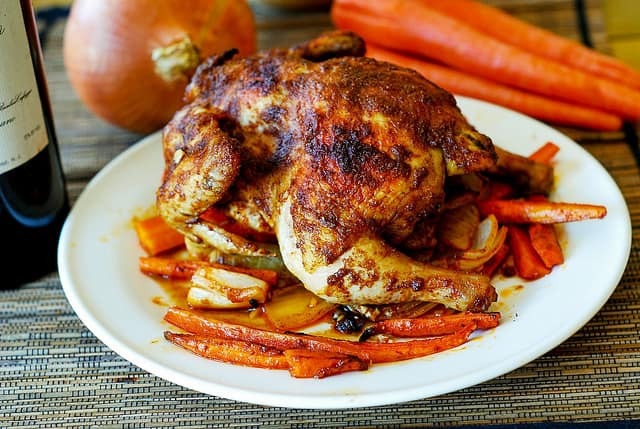 Paprika Roasted Cornish Hen with Vegetables (carrots and sweet potatoes) – a delicious way to prepare cornish hen. Great recipe for the Fall season, Thanksgiving and Christmas. 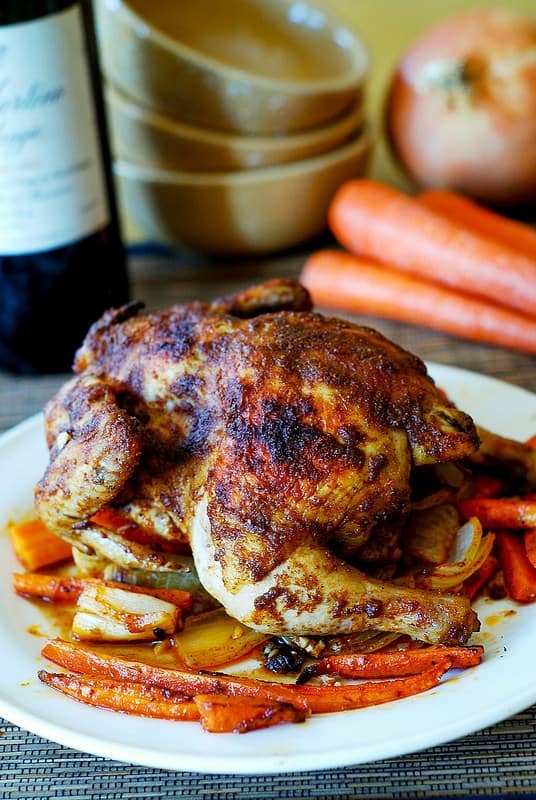 If you’re craving a simple comfort dish, try this roasted paprika Cornish hen with root vegetables (carrots, sweet potatoes) and onions. It’s delicious and full of flavor: Cornish hens are usually easy to handle and come out great no matter what. The recipe is simple, which is perfect for weeknight dinners after a busy workday. Whole Cornish hens look beautiful on serving plates – which makes this recipe a great choice for special occasions, too! I’ve cooked them for Thanksgiving and Christmas before. The birds in this recipe come out juicy, moist, with the flavorful juice – made with white wine, chicken stock, spices, and hen juices. Pour this juice over a simple side dish, such as rice or quinoa. You can also reduce these juices into a delicious thickened sauce. 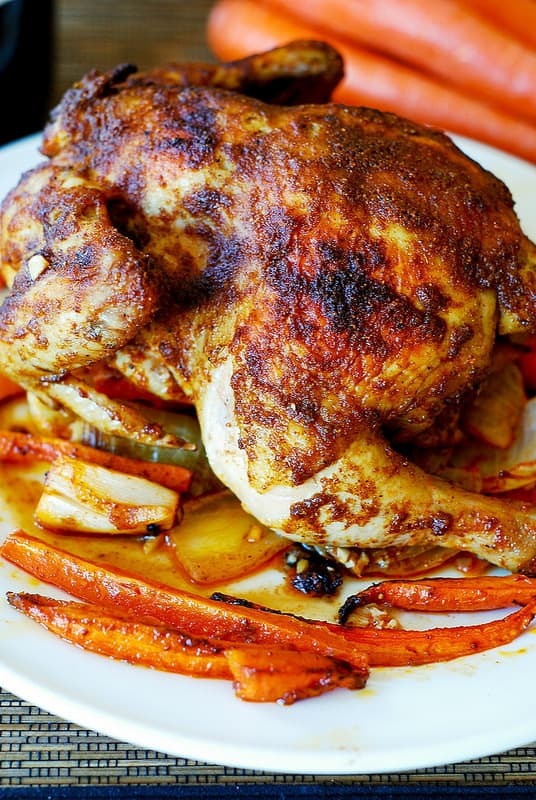 Roasted carrots, sweet potatoes, and onions complement paprika roasted Cornish hens perfectly. You can also serve these hens alongside a rice pilaf, quinoa, couscous, or you can cook some mushrooms in the hen juices. The recipe can be easily halved: you don’t have to buy 4 hens if you can get away with 2, right? 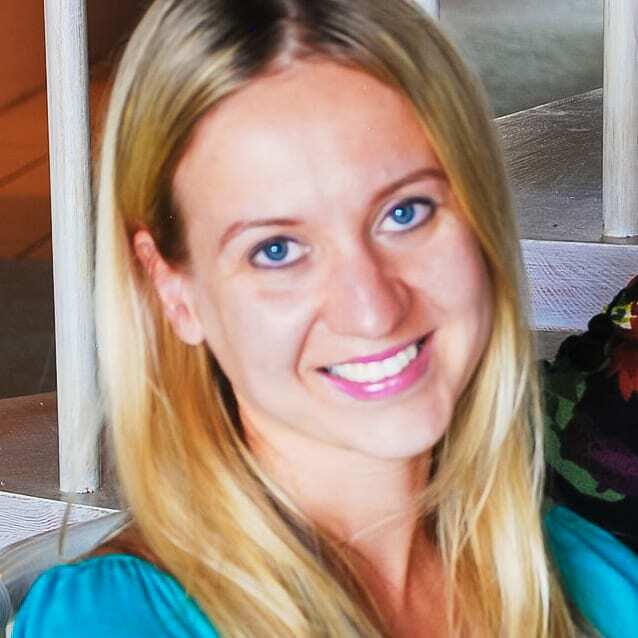 I actually prefer to just make 2 hens: my husband and I usually share one, and the second one can be used the next day. Roast Duck – an ultimate Thanksgiving or Christmas or New Year’s Eve main course! This Roast Whole Duck has tender and juicy meat, crispy skin, and it’s glazed with the honey-balsamic glaze to give the duck a beautiful roasted look. 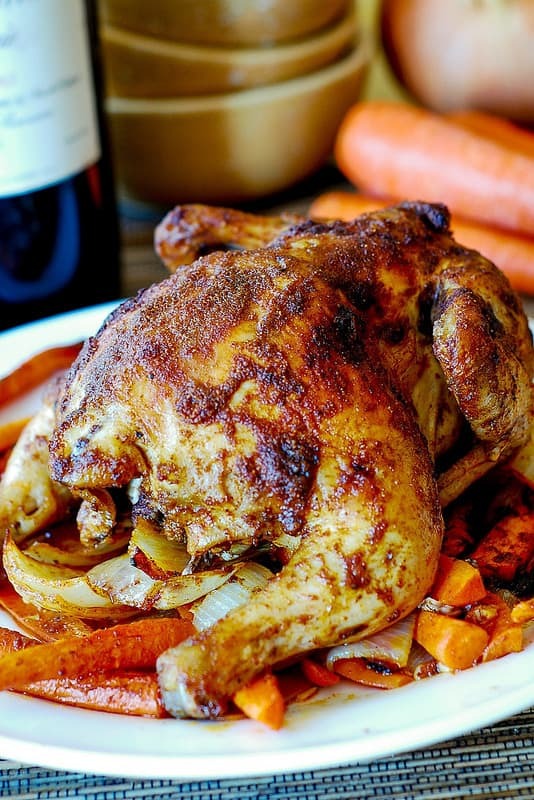 Paprika Roasted Cornish Hen with Vegetables (carrots and sweet potatoes) - a delicious way to prepare cornish hen. Great recipe for the Fall season, Thanksgiving and Christmas. Rub the insides of Cornish hens with salt and pepper and 3 minced garlic cloves. In a bowl, combine 2 tablespoons olive oil, paprika, chili powder, cumin, remaining minced garlic, 1/4 cup chicken stock and stir well to combine. Use 2/3 of this mixture to rub all over the outside of Cornish hens. Sprinkle the desired amount of salt over the outside of the hens. Sprinkle a very small amount of additional paprika over the hens (for color). Toss carrots, onions, and sweet potatoes in the remaining 1/3 of the mixture to coat. Sprinkle with salt and pepper. Transfer vegetables to the large roasting pan. Place hens breast sides up on top of vegetables. Add a little bit of chicken stock on the bottom of the pan to prevent vegetables from burning. Roast Cornish hens at 425 Fahrenheit for 30-35 minutes. Reduce heat to 350 Fahrenheit. Combine 1/2 cup of chicken stop and 1/2 cup of white wine and pour the mixture over the hens and into the bottom of the roasting pan. Continue roasting at 350 degrees F for 15-20 more minutes, basting hens with pan juices, until hen juices run clear. Transfer hens and vegetables to a platter. Make sure to pour juices from the hen cavities into a roasting pan. Cover hens with foil. Transfer the sauce from the roasting pan into a smaller saucepan and boil it down a little bit to thicken, if desired. You can also dissolve a little bit of cornstarch in water and add it to the boiling sauce to thicken it. After hens sit under the foil, pour juices from rested hens back into the sauce you just made. If desired, add more chicken stock to the thickened sauce. Serve Cornish hens whole or cut in half. Temperature and cooking time way off. I suggest lower temps. Hi! I want to make these for Thanksgiving next week. It just sounds perfect! Thanks for sharing. Two questions – when using the roasting pan, do you recommend using one with a rack or not? And secondly, you mention in the blog that the recipe is for four hens but the recipe itself calls for two – I am making four hens. Should I double what your recipe calls for? Thanks! You can use the roasting pan either with the rack or without. Both will work. Yes, you can just double the recipe if you want to use 4 hens. Happy Thanksgiving! Can you cook this in a crockpot? I dont have chili powder will this effect the flavor of this recipe? Maybe add some extra smoked paprika and the flavor should not be affected that much.